The 3rd international Uranium Film Festival will feature 51 films from 20 different countries screened between May 16th and May 26th in the cinema of Rio de Janeiro´s famous Modern Art Museum (MAM). The International Uranium Film Festival is an annual festival dedicated to all films, short and feature documentaries, movies and animated films about nuclear energy, atomic bombs, nuclear accidents, uranium mining, depleted uranium weapons and radioactive risks. The best short, feature and animated films of the festival are awarded with the "Yellow Oscar". Here is the final press release which includes the 2013 winners of the Nuclear Yellow Oscars and the Festival Director's speech at the awards ceremony. "Swedish Documentary of Latin America’s Chernobyl, in Goiânia in 1987. As defined by the director, it is a film of conflict of high technology in a Third World society." "Just outside Grants, New Mexico, is a 200-acre heap of toxic uranium waste, known as tailings. After 30 years of failed cleanup, the waste has deeply contaminated the air and water near the former uranium capital of the world. 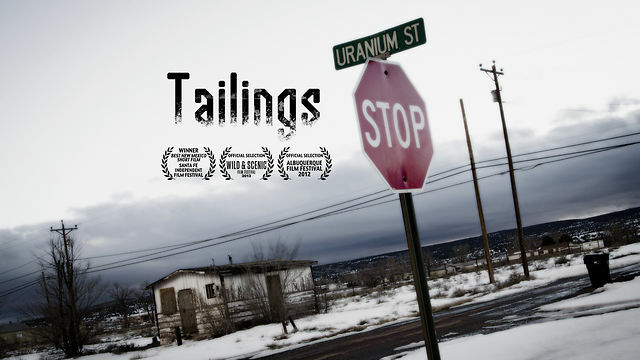 TAILINGS is a cinematic investigation into the pile that is gravely shaping the lives of those who are stuck living in its shadow." "In 2010, the United States announced the first new nuclear power plant construction in over 32 years. The "Nuclear Renaissance" was born, and American's long stared expasion of nuclear energy was infused with new life." "The Epilogue documents how one very determined grandmother, Elsie Mae Begay, travels with the film and continues to work with the filmmakers to launch a federal investigation into uranium contamination of Navajo dwellings and raise awareness about environmental health hazards in the Navajo Nation." "U 4 Uranium? is an independent feature-length documentary about uranium and nuclear power. The film exposes the true face of the nuclear industry and asks the question: Are you for or against the use of Uranium?" "With unparalleled bravery, journalist Shanny Hazzia goes behind the scenes of one of the most dangerous black markets in the world. In an attempt to unravel some of the mystery behind the uranium trade, she travels to Congo where her rare documentation allows a peak into the shady dealings of “the yellow market”. Congo is a conflict ridden country where many regions are controlled by militias. With little or no supervision the main victims become the villagers who live near the uranium mines. A powerful piece of journalism that takes on a very hot topic."